Zack Ruskin: Over the course of all the novels you’ve written, have you noticed any significant changes to the way you approach the task? Would an outside observer notice any differences watching you when you wrote The Patron Saint of Liars versus your most recent novel, State of Wonder? 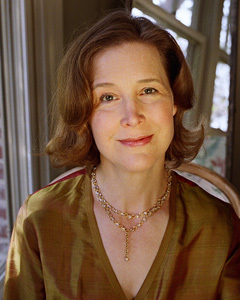 Ann Patchett: I love the idea of an outside observer checking to see if my writing habits have changed. It would be a sort of novel audit. I think the change isn’t as much in how I write as it is how I live. When I wrote The Patron Saint of Liars I had a fellowship at the Fine Arts Work Center in Provincetown. I sat at my tiny desk more or less all day, seven days a week. There was no internet, long distance calls were too expensive, and since it was Cape Cod in the winter there was no place to go. No one needed my attention for any reason. It was a thrill when Elizabeth McCracken and I walked into town for a drink. Back then I pretty much moved into the world of my novel and stayed there until I was finished. Life isn’t like that anymore. I spend a lot of my energy trying to carve out time to work and trying to push the world away. I travel so much now, I have responsibilities, I’m married. I have a full and happy life. Still, I look back on those days of never-ending silence and they seem like a dream. Every day felt like it was about three weeks long. I would write and write and write and feel like I couldn’t possibly write another word and it would only be eleven in the morning. I’d go to sleep for ten minutes just to have something different to do and then I would go back to work. ZR: Male authors are often asked about how they approach female voices in their fiction, but I’d love to know your take on writing the men in your stories. Is it more of a challenge to manufacture a male voice than a female one? If you had to pick a man from any of your books as the hardest for you to write, who would you select? AP: The way I see it, if I’m writing a character who isn’t me then it’s all pretty much the same. I have to build a whole new person from scratch. Whether that person is a man or a woman, from another country, a different race, it doesn’t matter. The trick is just to get outside of myself. I don’t think, what would a man say? Only, what would this one particular person say? I can’t pick one male character that was the hardest to write, I’d have to pick three: Teddy, Tip, and Sullivan from Run. I know nothing about the dynamics between brothers and I found the fact that they were both isolated from each other and completely engaged with each other pretty tricky. ZR: Something in the plot of State of Wonder reminds me of Richard Evans Schultes, the Harvard professor who sequestered himself in the Amazon, and Wade Davis, his adoring assistant and eventual chronicler in One River. Did Schultes’ story or other instances of similar behavior inspire your novel, or was it concocted purely from imagination? AP: You are absolutely correct. Dr. Rapp was inspired by Schultes, which I suppose puts Dr. Swenson in the role of Wade Davis. One River was a very helpful book. It was actually recommended to me by a man I met in the ichthyology lab at Harvard when I was working on Run. ZR: Did you travel to the Amazon in preparation for writing State of Wonder? If so, how was that experience for you? AP: I did go to the Amazon to research the book. I stayed for ten days, which was about five days too long. It was incredibly helpful to get to see all those trees, the color of the water, the birds and snakes and bugs, but after awhile all I wanted was to get out of there. The jungle is so claustrophobic. It just presses in on you from every possible angle. You can’t exactly go for a stroll to clear your head. That feeling of having nowhere to go, no way to get out, made its way into the book. ZR: Not to play spoiler, but loyal Patchett readers will find the familiar territory of opera somewhere in the expanses of your new novel. Were you inclined to include opera as a nod to your past work, or was it perhaps more like a wink towards Herzog’s “Fitzcarraldo”? AP: You’re getting all my references! The first time I saw the Amazon was in Herzog’s films, through Herzog’s eyes. In all honesty, I could have skipped the trip and just watched “Aguirre: the Wrath of God”, “Fitzcarraldo”, and “The Burden of Dreams” (the documentary about the making of “Fitzcarraldo”) over and over again. The opening scene of “Fitzcarraldo” in which he’s making his frantic arrival to the opera house in Manuas made an indelible connection in my mind between the jungle and opera, so the scene in State of Wonder isn’t a reference to Bel Canto, it’s a reference to Herzog. Renee Fleming was supposed to sing in that opera house and I was going to go with her, but then there was a schedule change and she wound up not going. I was so set on going there with Renee that I couldn’t imagine going without her. My one view of the opera house came from the film. ZR: I’ve read that you completed State of Wonder in a more limited time-frame than most of your other novels have taken to write. Do you have any insights as to why the prose came faster for this work? AP: This was the easiest book I’ve ever written, with the possible exception of Truth & Beauty. I understood the characters, I understood their connections. I had tremendous fun with all the things I got to make up. Bel Canto and Run were both huge stretches for me, I felt like I was pulling myself up a sheer cliff with my fingernails. Then I came up with another idea for a novel that seemed impossibly hard and I thought, why not forget this, do something fun? State of Wonder was fun. Fun is always faster. ZR: What are some books you read while prepping State of Wonder, related to its writing or to distract yourself from it? AP: Of course, Conquest of the Useless: Reflections on Making Fitzcarraldo, by Werner Herzog, was awfully good (and beautifully written). I read Wade Davis’ book, as I mentioned before. I read all the popular books on the Amazon from River of Doubt to Lost City of Z. My favorite was In Trouble Again; A Journey Between the Orinoco and the Amazon, by Remond O’Hanlon. It’s both horrifying and hysterical while the others were only horrifying. What was interesting about all those books is the way in which they all started to blend together. We can all have our own take on the Amazon but at the heart of it there is a very basic theme: bugs, heat, leaves, omnipresent danger. When I wanted to get away from the Amazon I read Henry James. No world is farther away from the jungle than James’. ZR: When you utilize a setting as rich as the Amazon, it would seem easy to lose your characters in the immensity of the location. Did you find you needed to make a concentrated effort to keep Marina and Annick the center focus? AP: Not at all. As I said before, what my short time in the Amazon taught me is how claustrophobic it is. No one wanders off. Marina is obsessed with staying on the path. She knows she has to always come back exactly the way she came or she’ll be lost forever. I wound up keeping a hyper-vigilant focus on my characters. ZR: State of Wonder weighs-in as your longest novel. Was this because the plot demanded it? Was the original manuscript much longer? AP: Who knows? Maybe it was longer because it was more fun to write. My friend Liz Gilbert read the manuscript and told me to cut 75 pages from the first half of the book. She said all the scenes needed to stay as they were, all the exchanges, all the facts, I just needed to make it faster by cutting out extra sentences, phrases, and single words. And I did it. It was amazing how easy it was to trim it down. ZR: Why do you think the Amazon is such a lasting and intoxicating subject matter for literature and film? From David Grann’s Lost City of Z to the newest Indiana Jones film, audiences seem to have an insatiable appetite for the setting. What drew you to write a novel set there? AP: The Amazon is a giant open canvas for the imagination. You feel like anything could happen there, and that’s a great place from which to tell a story. Personally, I needed a place with malaria in which another, highly profitable drug might also be developed. I didn’t see it happening in India or Africa. This interview appeared on the Book Passage blog on June 13, 2011.